This chakra is to see the compatibility of a devata’s name with an individual’s chart. The first letter of the devata of a mantra is looked at in the chart in relation to the Janma lagna (the Moon sign). If the first akshara (syllable) of the name is situated in trines (1,5,9) then the person will get siddhi from the mantra. If the akshara falls into 6, 8, or 12 then the mantra should only be done with the advice of the Guru, for it may have negative effects depending on the devata and the lineage of practice. Other placements can be judged accordingly. This chakra is not used very much in our parampara, but for very particular situations it is used to check the suitability mantras. This chakra was taught publicly by Sarbani Sakar at the 2004 SJC West Coast Conference. Recordings are available through Laksmi Kary. 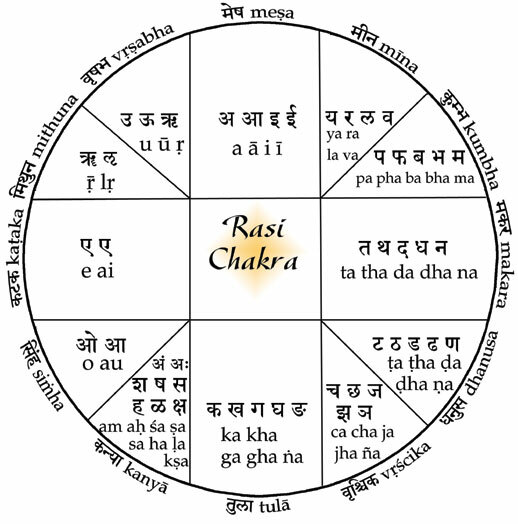 Original chakra is from a Bengali book called Brihat Tantrasara by Krsnanada Agamvagish.